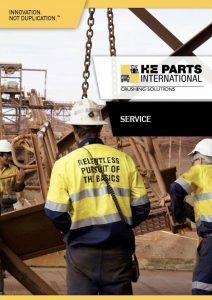 H-E Parts service division specializes in mineral processing applications and offer off-site repairs, on-site service and are dedicated to increased safety, efficiency and risk prevention in the mining and quarrying industries. Combined with best in class practices and experienced technicians, H-E Parts services utilize in-house engineering knowledge, custom-design tooling and learned expertise to not only deliver exceptional service to their customers but often provide innovative solutions to reduce total cost of ownership for their plant. H-E Parts added value is achieved by providing fit-for-purpose design, innovation through engineering and quality through service performance. We have been reducing the risks associated with the installation, maintenance, and servicing of mining, quarrying and processing equipment since our inception, and this can be demonstrated through our range of certified crusher safety lifting devices, designed and patented by our in-house engineering department. H-E Parts is capable of offering a full product lifecycle and service solution from; products and parts supply, to engineered application design, manufacturing, assembly and installation, training, on-site and offsite repair, workshop rebuilds and decommissioning.